Say what you will about Coldplay and their frontman Chris Martin, but he sure has a big heart. When the band was in Singapore last weekend (31/3 - 01/4) to perform at the Singapore Sports Hub, their public profile was kept to a minimum. That, except for a short period when Chris Martin made a trip to KK Hospital to visit the nurses and children in the building. 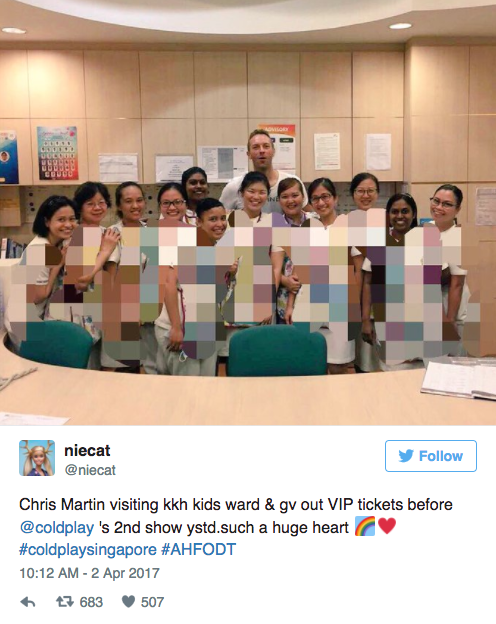 Originally reported by Mothership, Twitter user niecat — whose account is currently deactivated — tweeted a photo of Martin with a cluster of nurses and children (the latter blurred out of the photo) on Saturday afternoon, just before Coldplay's second show at the arena. Martin himself gave out VIP tickets for the night's concert — which was already sold out — to the group, just solidifying his good guy status. Additionally, in the Philippines — where Coldplay will perform for the first time tonight (4/1) — Chris Martin visited a cancer-stricken fan named Ken Valiant Santiago, who saved up to buy a ticket to their show before being diagnosed with Stage 4 Cancer two months ago. The band is set to perform in Manila at the MOA Concert Grounds on April 4th. Here's what happened when they performed in Singapore.